The wind whistled around us and, as we hid under a tree watching the brief rain shower blow past, we discussed our favourite Disney princesses before moving onto a debate about the nautical statues in the lake at Vevey. Apparently, and I was proven wrong, they are not mermaids but most definitely fairies on seahorse-back, I stand corrected! Katherine’s lovely little girl is a wonderful character and all set to be the perfect big sister to her new baby brother. 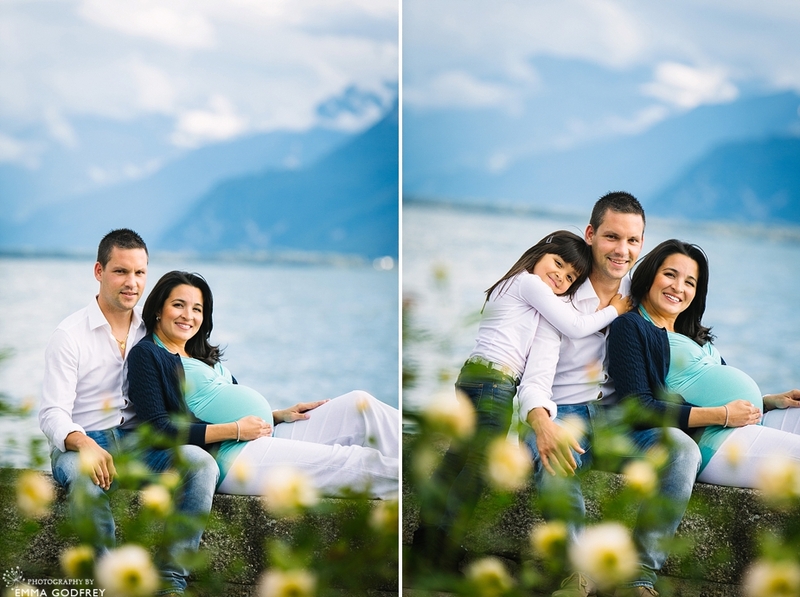 Her first Vevey family photography session was a maternity shoot on the shores of Lake Geneva and began as a very blustery day. We sought shelter in their courtyard before heading along the lake to meet up with Samuel. I often get asked if it’s important for a husband to come to a maternity photo shoot. Seeing just how Katherine reacted as Samuel arrived and wrapped his arms around her reinforced my opinion that, even if he’s only in a few pictures, it’s really nice to have him there. There are so many things to think about when you are pregnant, especially if you already have little ones to look after, that having that extra support shows in the way people relax around their other halves. We had great fun as the wind died down, running races in the old town and playing games with Adrianna who was so full of energy it was revitalising. Don’t you just love those stormy skies? I can’t wait to put them in their Storybook album together with the family’s newborn session in a couple of months time. My particular brand of relaxed, natural lifestyle family photography is taking Switzerland by storm this year and I am almost fully booked for 2014, but if you would like to book a 2015 family photo shoot to celebrate a new addition, a special birthday or just because you would like some truly fabulous pictures of your kids – get in touch to find out more.